Gold Rate - SMS Alert Service! Providing Free Gold Rates on Mobile. Get SMS of Live International Gold Rates & converted rates in PKR on your Mobile as daily up to 5 times. 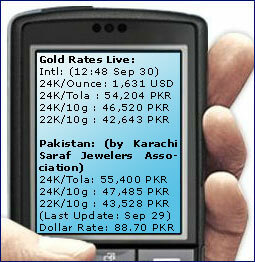 Also Gold Rates in Dollar and Pak Rupees Including daily updates by "Karachi Sarraf & Jewelers Association (KSJA)". 21k k kiya rate hain?